Designed to assist you with the healthy maintenance of your hair, nails ansd skin, these Hair and Nail Supplements by 3" More Inches boast an innovative formula that really works. Working to restore connective tissue, these supplement tablets contain folic acid, pantothenic acid, and copper to aid hair pigmentation, whilst Vitamin A and zinc aid cellular growth and Horsetail gives structure and strength. 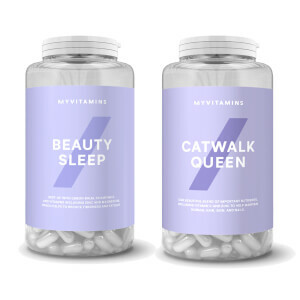 Specifically suitable for vegetarians due to their rich levels of iron and vitamin B12, these Hair and Nail Supplements will give you brighter hair, supple skin and stronger nails. K.D. One 3" More Inches by Michael Van Clarke Hair and Nail Supplements to be taken three times daily with food.